Year round near-perfect weather and breathtaking scenery make a Destination Wedding in Hawaii a favored choice for couples wishing to tie the knot! Not to mention, no need for passports for the bride, groom and their guests! 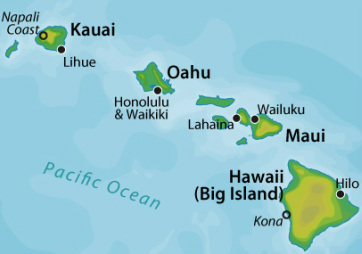 Each of the six main Hawaiian islands, each with its own individual character - Maui, Oahu, Big Island, Kauai, Molokai and Lanai - with white sandy beaches, cascading waterfalls and lush tropical landscape, surrounded by magnificent beaches and sparkling blue ocean, back dropped with beautiful mountains...the epitome of "Paradise"! Consider having your wedding on one island, then moving to another island for your honeymoon! From its heavenly beaches to its scenic natural wonders, there are plenty of reasons why Maui, the second largest Hawaiian island has been voted “Best Island” by readers of Conde Nast Traveler for many years. The heart of Hawaii, Oahu blends timeless beauty with the modern luxuries of today! Swim in the warm waters of world-famous Waikiki one moment, enjoy the dramatic mountain views of the Nuuanu Pali Lookout another! Marvel at one of Oahu's spectacular natural wonders, Diamond Head... experience a Luau, take a Surf lesson, visit Pearl Harbor and more! Kauai, Hawaii's island of discovery, situated among gorgeous valleys, mountains, tropical rainforests and incredible waterfalls could be the perfect choice for a Destination Wedding! Experience the breathtaking coastal range of the Napali Coast, accessed only by hiking, sea or air! Revel in the beauty of the Waimea Canyon, kayak down the Wailu River, explore the Wailua Falls, take a hike, discover 50 miles of heavenly beaches and more...there are plenty of activities to keep you and your guests busy! Couples may choose to host their Destination Wedding on the island of Hawaii, which is the youngest and by far the biggest Hawaiian island providing a vast canvas of personalities, from lush rain forests to volcanic deserts, snow-capped mountaintops to beautiful black sand beaches! Explore the island's natural wonders...Kilauea, one of the world's most active volcanoes or the snow-capped Mauna Kea, which you can ascend to experience the breathtaking sunset and celestial show above the clouds! Discover the waterfall-studded east coast and witness rainbows near Hilo or indulge in the exquisite panorama from the Pololu Valley or Waipio Valley lookouts!